Utagawa Hiroshige (1797-1858) Famous Places of Edo (Edo Meisho): Kasumigaseki, Early 1854. Oban. 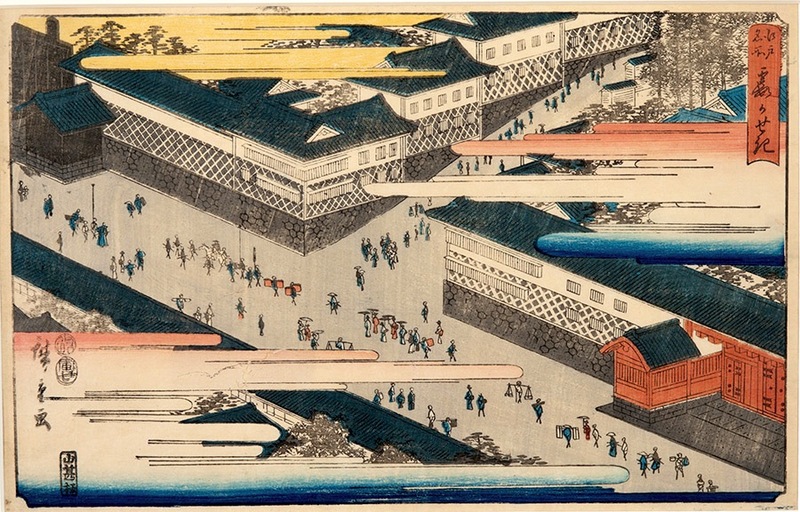 A fine Hiroshige; a stunning and unusual perspectival view of Edo through highly stylised clouds, probably from a miscellaneous series of views of 1854 showing a temple precinct to the right of the picture and hurrying crowds in the thoroughfares. This is a great view and I am reminded of Basil Stewart’s comment above: One wonders whether the historical and topographical value of his prints has yet been realized by his fellow countrymen. Kasumigaseki, (misty barrier) was the name of the area of Edo nearest to the castle. The name derives from the control barrier on the road to Oshu. The area looked across Edo Bay and was one of the most famous views in the city. It was up this street that the procession of the San’no festival travelled which took place at the Hei temple. Hiroshige made many near identical views of this scene, such as this one in the collection of the Museum of Fine Arts in Boston. The print is full size, untrimmed and with complete margins. The colour is very fine, the impression is good except for some ink offset on the outer margin and a mis-register to the kiwame seals. The condition overall is excellent, with the exception of two worm holes in the lower portion. A very good print.